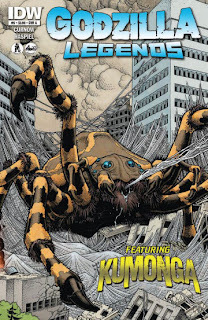 Comics Experience Blog: COMMUNITY NEWS: CE Alum Bobby Curnow's Godzilla Legends #5 on Stands Today! 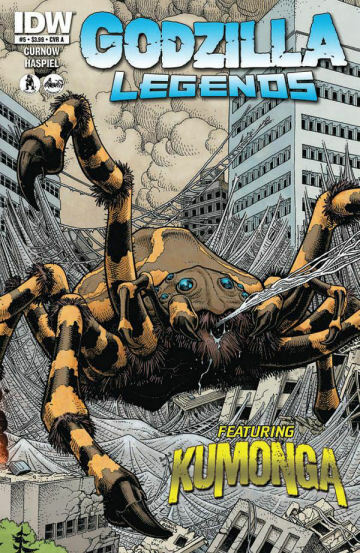 COMMUNITY NEWS: CE Alum Bobby Curnow's Godzilla Legends #5 on Stands Today! Writer Bobby Curnow has a new book on the stands today: Godzilla Legends #5! Bobby is both a Comics Experience alum and a member of the Creators Workshop, where he offers members pro critiques on their work. Godzilla Legends #5 has a story written by Bobby with art by comics great Dean Haspiel. In the story, an old adventurer comes out of retirement to climb Godzilla! The issue is on stands right now with covers by both Art Adams and Bob Eggleton. Bobby's new creator-owned miniseries, Night of 1,000 Wolves, is solicited for pre-orders in the current March Diamond PREVIEWS catalog and will be in stores in May. That title features artwork by Eisner-nominated artist Dave Wachter. Bobby is also an editor at IDW where he began by editing titles like Robert Bloch's That Hellbound Train and John Layman and Alberto Ponticelli's Godzilla: Gangsters and Goliaths before moving on to his current position working on both the Teenage Mutant Ninja Turtles and Godzilla franchises. Congrats on your Godzilla tale hitting the stands, Bobby! The actual ceramic appears wonderful and never just will it appear much better than the actual steel 1 about the replica watches however can also be incomparably much more fake watches making certain it'll appear excellent age range in the future. Ceramic doesn't actually diminish within colour possibly, therefore hug farewell any kind of patination expectations whenever is actually some thing you had been getting excited about. The actual tag heuer replica uk is simpler to seize as well as turn compared to about the Tudor as well as… on the watch-nerdy however essential be aware, the actual rolex replica sale feels as though absolutely no additional I've actually utilized. As the Tudor offers sixty big, strong leaps in one click on to another, this seems nearly overdone a little. By comparison, the actual replica watches feels as though the fine-adjust button on the fake breitling architectural device.